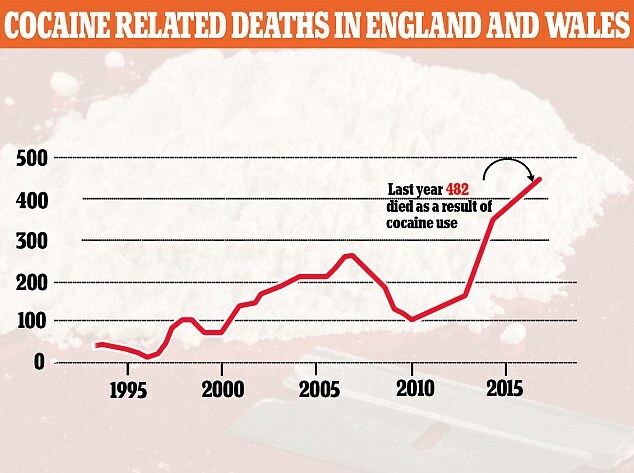 The government has come under increased pressure to investigate the spike in deaths from cocaine use, which has almost quadrupled in seven years. There were 432 deaths related to the drug in England and Wales in 2017, compared with 371 the previous year and 112 in 2011, figures from the Office for National Statistics reveal. The number of deaths from the drug has increased for the sixth year running, with 7.5 deaths per million population last year. And executive director of drugs charity Addaction, Karen Tyrell, said the Home Office must act to find why the number of deaths was rising. 'The numbers [dying from drug misuse] are scandalous. They are two and a half times higher than the numbers that die in road traffic accidents,' she told the Guardian. Cocaine use can cause heart attacks, strokes and heart failure, with an increased risk of side effects when it is combined with alcohol or more drugs. The UK has a higher rate of cocaine use than anywhere else in Europe, with 9.7 people having reported using the drug. Powdered cocaine is the second most used drug in Britain after cannabis, with 875,000 people reporting having used it in the last year. 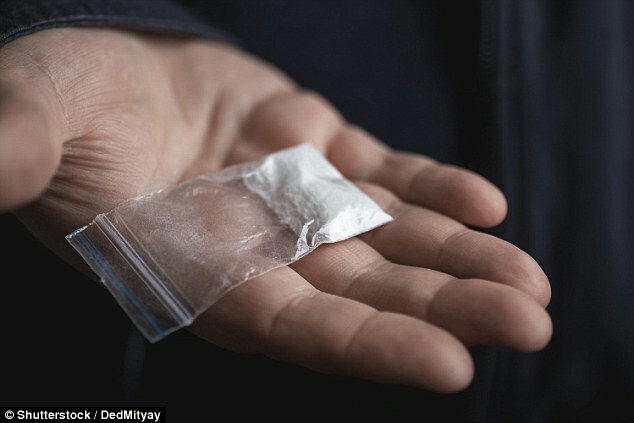 One possible reason for the rise in deaths is that the purity of street cocaine across Europe has increased every year from 2010, according to the European Monitoring Centre for Drugs and Drug Addiction. Production in nations such as Colombia has also increased. 'We've seen a year-on-year increase in the purity of cocaine,' Dr Prun Bijral, medical director at charity Change Grow Live, said. WHAT DRUGS WERE RESPONSIBLE FOR THE DEATHS? Last year some 2,503 people died from general drug misuse in England and Wales. This compares with just 831 in 1993. There were 75 fatalities linked to fentanyl in England and Wales last year, an increase of 29 per cent from 2016, when there were 58. Fentanyl, originally developed in Belgium in the 1950s to aid cancer patients with their pain, is also partly behind a growing opioid crisis in the US. Even a tiny amount of the painkiller, which can be up to 10,000 times stronger than heroin and often sold on the dark web, can prove fatal. Deaths involving heroin and morphine are 10 times higher than they were in 1993, when just 115 fatalities were recorded. However, deaths involving both opioids decreased by four per cent last year to 1,164, the first decline since 2012. Cocaine deaths have risen rapidly for the past six years. In 1993 only 11 deaths were caused by cocaine, and in 2011 just 112. The ONS figures published earlier this month did not disclose whether deaths were caused by powder cocaine, or by crack cocaine. It comes after a global drugs survey in May revealed cocaine can be delivered more quickly in England and Scotland than a takeaway pizza. Some 36.8 per cent of people surveyed in England said they could get cocaine within 30 minutes, and 37.4 per cent in Scotland, placing them fifth and sixth in the world rankings. This compared with 12.2 per cent of people in England and 19.8 per cent in Scotland who said they could get a pizza delivered in this time. The report said dealers were competing for customers not only through product quality but through speed of delivery, with easy access and higher purity 'likely to lead to escalating use and harms among people'. just let them kill themselves.